We all know that volatility tends to expand when in a downtrending bear market. Less frequently, volatility expands when price is trending higher. One of the things I look for when trying to anticipate the end of a bull market is “upside volatility expansion”. Volatility expansion while price is trending higher is a sign of unusually intense disagreement among market participants. A break in either direction from violent price auction tends to leave many people on the wrong side of the trade and leads to outsized moves. It can also be a sign of distribution, signaling that long-time holders are sellers and not likely to be buyers again without a significant discount. 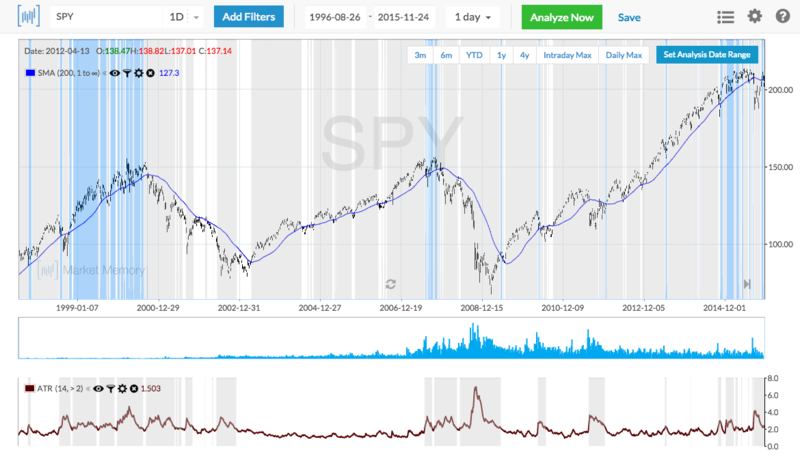 The highlighted days in the chart below show all the times when the average trading range of the S&P 500 ($SPY) is higher than $2 over a 14-day period and above the 200-day moving average. The average true range is a great way to gauge volatility. You can immediately notice that this phenomenon has preceded some significant bear markets. One of the problems is that upside volatility expansions are similar to divergence in that it can persist for significant periods of time, and overcoming the divergence is further evidence of a strong market (see 1999). Therefore, this latest uptick in volatility needs to be seen in the proper context and returns horizon. It’s not a “signal” on its own because it needs other coordinating elements to increase its significance. We appear to be sitting at an interesting juncture in the market. There are currently positive seasonality and momentum in the market (shrugging off Chinese market implosions, terrorist attacks, warplanes, etc.). I feel constructive in the immediate term and think the market, especially large caps, grind to new highs. I also see one of the biggest asymmetries in risk reward in a long time over a medium term horizon. In my view, the next medium term leg in the market (1-2 years) has about 10% upside reward and 40% downside risk. In other words, the market is going to continue to serve up incredible opportunities, risks, and rewards as it always has and always will.